My son had a check up recently. He’s fine. Better than he’s ever been in fact. SHe asked about his eating and we told her that he’s basically a vegetarian that eats hotdogs and chicken nuggets. Other than that, he sticks to fruits and veg. So she told us her recipe for home made chicken nuggets and he really wanted me to make them. It was quite simple. Scramble up one egg in a bowl. In a separate bowl mix bread crumbs, salt and pepper to taste. She suggested adding parmesan cheese however we have some dairy adverse family members so we left that out. I bought raw boneless, skinless chicken tenders in the meat section. They were quite affordable. I dipped them in the egg and then rolled them in the bread crumb mixture. 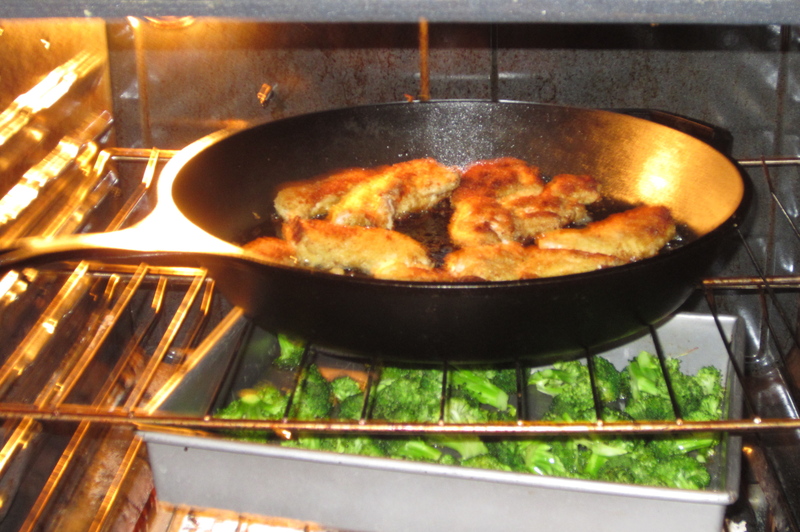 Then I fried the tenders in olive oil. Once they were cooked on the outside, I stuck the whole pan in the oven for about 15 minutes. I was also roasting broccoli simultaneously. I know there are fancy recipes for roasted broccoli on Pinterest but honestly, I just toss the broc with olive oil, salt and pepper and roast is at 400 degrees for 10 minutes on each side. Anyway, you know the dinner was good when your husband brings home more chicken the next day and asks you to make it again. I’m planning to make this for dinner again tonight. Simple and tasty. We have a really good pediatrician. Tags: chicken nuggets, chicken tenders, salt and pepper | Permalink.